Visit Advanced Auto Repair in Davis Today! Click on an item to download printable coupon. Check our site often for more deals! 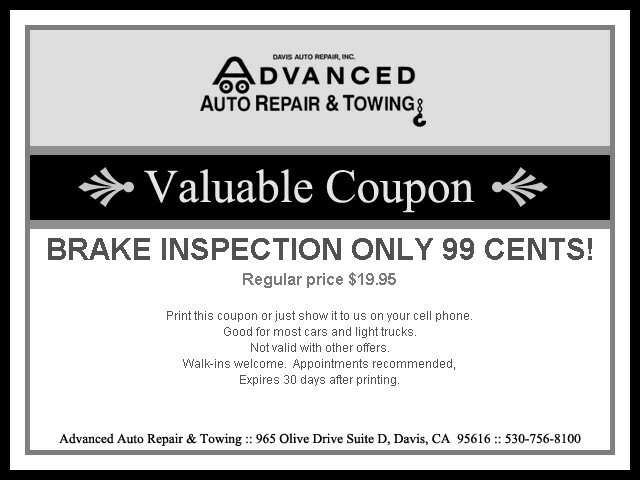 Your one stop shop for all your automotive needs in Davis! 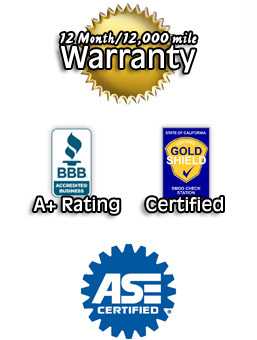 We are a proud member of the Better Business Bureau since 1991 and have an A+ rating. We are conveniently located near Interstate 80 & Richards Blvd and we are a short walking distance to downtown Davis, the UCD campus Amtrak and a Unitrans bus stop. 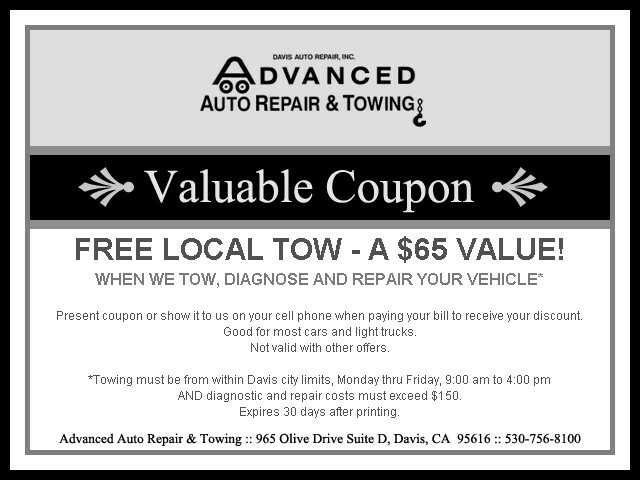 Family owned and operated, Advanced Auto Repair and Towing is dedicated to excellence in service and has been serving the Davis community since 1982. 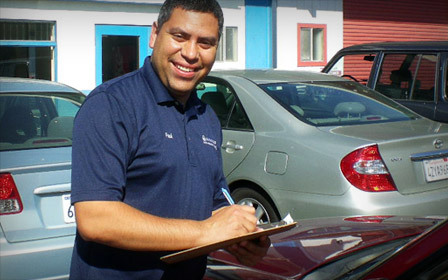 We service and repair most makes and model vehicles including foreign, domestic, and hybrids, from oil changes and tire repairs to engine rebuilding. 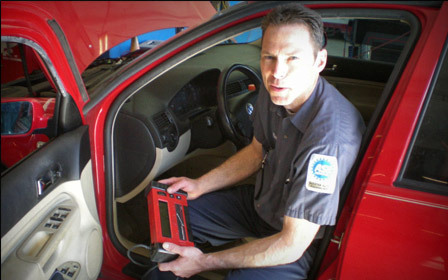 We are your smog inspection/repair experts. 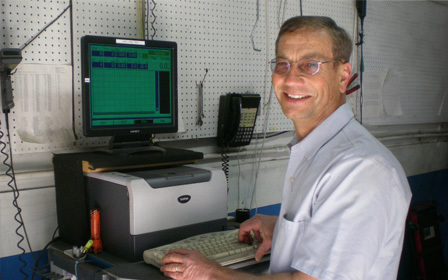 As of November 8, 2012 we can inspect STAR directed vehicles. 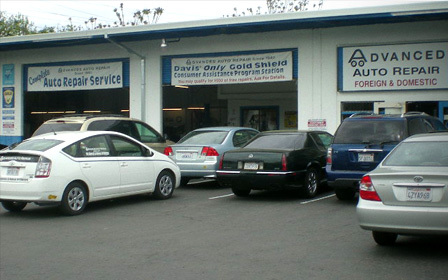 We are Davis’ only Gold Shield Station which allows us to make repairs to your vehicle for emission failures and provide you with financial assistance from the state. You can trust us to treat you right. Free personal shuttle service to your home or work in Davis during normal business hours (no waiting for a van and no designated times). Early bird / late night drop off available. Schedule appointments by phone or online. 24/7 towing and emergency road service. 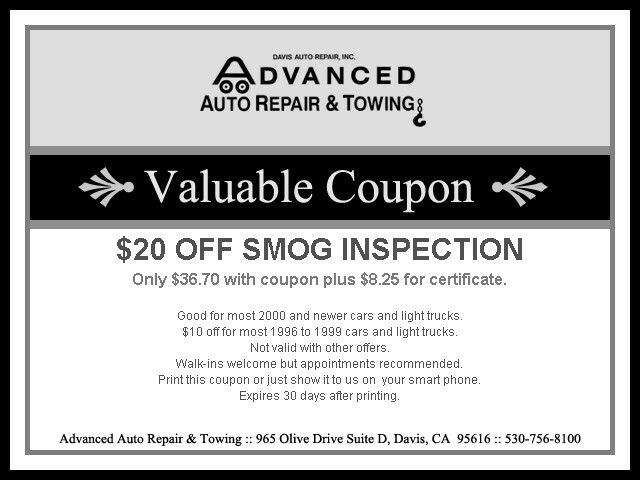 Smog inspection appointments and walk-in inspections available. 12 month, 12,000 mile limited warranty on all repairs.